Lady of many colors, or should we say a Tittli (butterfly) who collects nectar …. Yes, we are referring to Sweta Jha, India’s ambassador of Madhubani Art to Singapore and founder – director of Ttitli, a Gallery of Madhubani Arts in the heart of cultural Singapore. Having been acclaimed for her work, nationally and internationally, the quiet artist buzzes with her work. Over the years, Sweta has given a contemporary touch to otherwise very traditional Madhubani Art. Being at Singapore for almost eight years now, her love for the country can be seen in her paintings. Above painting talks about Singaporean icon Mer Lion, the Singapore airlines, SIngapore Flyer, Santosa Resort and the multi-religion multi-culture of the nation. TheWOOMag: Tell our readers something about you? Sweta Jha: I am a person who loves nature, its myriad colors, moods and diversity. Being born in a traditional Mithila family, i opened my eyes to see this abundance of nature all around which got further accentuated by Madhubani art that I kind of inherited as a legacy. I naturally and unconsciously picked it up at a very young age. My avidity to learn more about this enigmatic art continued to grow by the time i reached college and university levels. After marriage when I moved to Singapore in 2007, I more seriously started to pursue my thought of taking my gift to the whole world in a professional and structured way. And as a result of those years of persistent efforts and toil, here i am today talking to you. TheWOOMag: How and when your adventure with Madhubani painting start? Sweta Jha: My parents tell me that when i was about 3 years old, I drew and painted Lord Ganesha on paper. My mother was so amazed to see this that she introduced me to some of her relatives who were more actively doing this art so that i could learn the finer aspects of it. 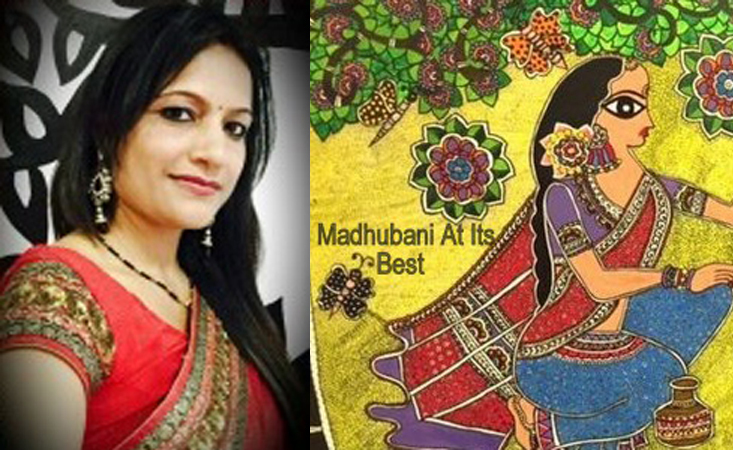 Later, she continued to encouraged me to continue my passion and so my love to own and adopt Madhubani at my soul level began growing deeply. TheWOOMag: What all inspires your work? Sweta Jha: I draw my inspiration largely from the nature and sweet nothings that form the daily humdrum in the life of my fellow womenfolk who go through everyday grind like me. I notice simple things like my kids playing or how they interact with the world, a gorgeous sunset, a falling leaf, serenity of Buddha etc. Any of these elements can trigger my mood to pick up my pen and paint and start to draw. TheWOOMag: Which Indian and international artist you admire most? Sweta Jha: From India, I admire works of Ms Bharti Dayal who is one of the pioneers of contemporary Madhubani art. I also find Mr Ramesh Gorjala work fascinating. Internationally, Pablo Picasso remains an eternal inspiration. TheWOOMag: Which artist is your inspiration or you identify with? Sweta Jha: If you would notice, my works are mostly an amalgamation of traditional Madhubani and modern art. Although no specific name comes to my mind who is active in this genre, i do admire Ms Meenakshi Jha Banerjee, Urmila Devi and Manisha Jha’s works. TheWOOMag: Your work is unique. You have given contemporary touch to the Madhubani Art. Did it all start with an idea or a need to reinvent yourself? Sweta Jha: The fact is, except a few courtiers like Japan and India where it comes from, Madhubani is not yet a mainstream or widely recognized art abroad including Singapore. So far it has been quite an effort for me to showcase this timeless and rich art to the larger world. However, it is a joy every time I see my works get featured in Singapore media – both print and online. Off and on, I participate in art and cultural shows organized by community and government bodies. 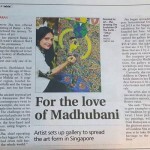 In 2011, I was felicitated by Singapore DPM for my Rangoli work that I did in Madhubani. The journey so far is pretty sprinkled with such fabulous instances. TheWOOMag: You are very humble! TheWOOMag: Titli – Gallery of Madhubani Arts. Why Titli? Sweta Jha: Ttitli or butterfly symbolizes myriad of colors, freedom to own the skies around it, a life that is fragile and transient and above all, its natural and magical metamorphosis from a delicate cocoon into a gorgeous butterfly. Through my Madhubani art, I aspire to take similar life journey, metaphorically, personally as well as professionally. TheWOOMag: What is the objective of your gallery? TheWOOMag: What’s your take on the ongoing battle of artistic freedom Vs Moral responsibilities? Do you think an artist’s creative freedom is the most important? Sweta Jha: I believe an artist’s mind and thought should never be chained in the pretext of cultural, religious or social dogma. I understand it is a sensitive topic but my personal take is that a work of art is as sacred and integral as is the very existence of our universe. TheWOOMag: Do you think for a woman to be successful, her husband’s and family’s support is very important? Sweta Jha: Family ecosystem and emotional stability play key role in any successful story – personal or otherwise. For a woman, especially in Indian and Asian context, this need is all the more highlighted as our society expects us to be super-humans who must effortlessly juggle between work and family. I am fortunately blessed with a supportive husband and a loving family who is always there in my mission of bringing my passion to the whole world. TheWOOMag: With more recognition of your work, do you feel there are the responsibilities on your shoulder have gotten bigger? Sweta Jha: As Schwartz once famously said, “In dreams begin responsibilities.”, I feel each of us must take complete responsibility of what we do, more so when our work touches a larger world. It is regardless of our level of acclaim or recognition. I have always kept this as one of my guiding principles to navigate through life challenges. TheWOOMag: How do you manage your work life balance? Sweta Jha: Being a mother of two young kids, my challenge to maintain work-life balance is as complex and taxing that of any other woman who is at similar life stage that of mine. To start with, I try to keep a disciplined approach and prioritize work as they happen and vie for my attention. To have a wonderfully supportive husband makes this task a bit easier for me. At the end of the day, I somehow manage to achieve my daily goal to to set aside minimum ten quality hours to pursue my artistic passion. This is all that I need to keep myself happily going forward. TheWOOMag: What would you like to say to upcoming women artists? Sweta Jha: Never get disheartened by your critics. Remember that those who are your critics today were once like you who just got scared along the way and gave up their passion. So NEVER give up and believe in yourself and keep walking! TheWOOMag: What do you think of TheWOOMag? Sweta Jha: TheWOOMag is doing great service to our larger society in general and to my fellow womenfolk per se. Through its creative and talented team that is made of gifted professionals like you, it is propagating best practices, celebrating success and bringing larger opportunities at the forefront to inspire and elevate real women and their everyday real efforts. I deeply admire and appreciate all that your unique platform is doing to serve our society and wish you my very best to its continued success ! TheWOOMag: Thank you so much Sweta. It has been our pleasure to know you and talk to you. Wish you all the best for your future work and may God bless your lovely family.